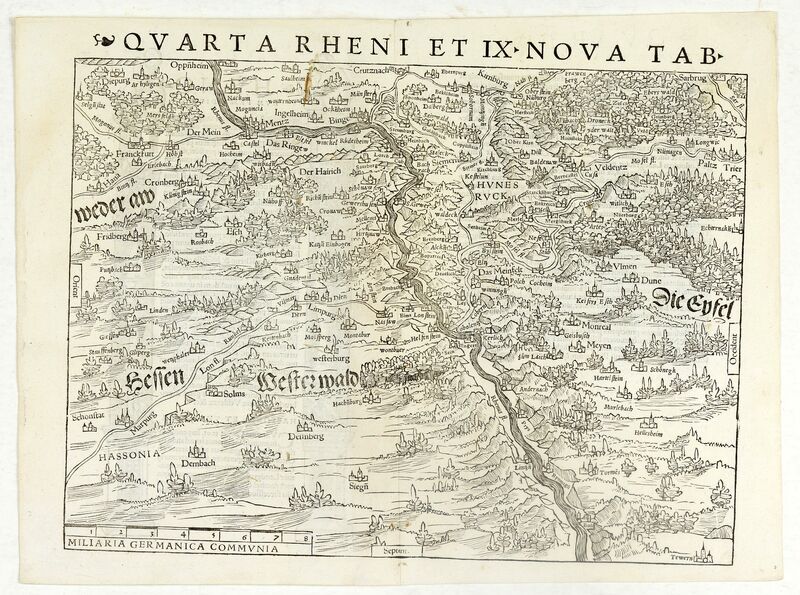 Old map by MÜNSTER -Quarta Rheni et IX Nova Tab. Title: Quarta Rheni et IX Nova Tab. Size: 10.8 x 13.4 inches. Condition: Wood block print with letter press. In good condition. Highly detailed regional map of the course of the Rhine, from Mainz to Bonn, one of the first obtainable modern maps of the region. Extremely detailed for the period. The map is unchanged from the 1540 edition. Munster's Geographia was a cartographic landmark, including not only Ptolemaic maps, but also a number of landmark modern maps, including the first separate maps of the 4 continents, the first map of England and the earliest obtainable map of Scandinavia. Sebastian Münster dominated cartographic publication during the mid-16th Century. Some slight discolouration on verso but not visible on recto.